Bi-color pink and white salvia 'coral nymph' (salvia coccinea) - Hardy ornamental sage variety native to Mexico and the South. 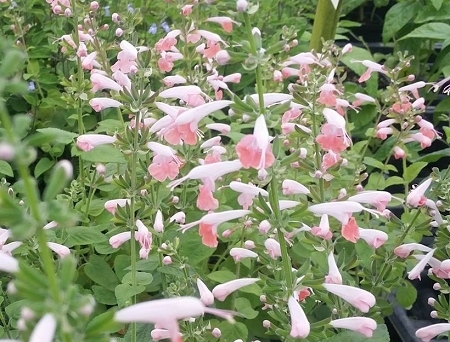 Heat and drought tolerant salvia produces a multitude of pink and white bi-colored blooms that attract hummingbirds and butterflies to the garden. self seeding annual, can be grown as a perennial in warm (zones 9-10) climates. Live plant in 3 inch container.